"Liberal order and software-agents" - long-established ideas and modern technology are bridged. The impulse for undertaking this effort comes from the observation that it becomes difficult for computer science alone to create order for and within machines. The growing complexity of computer systems, open networks like the Internet, and the increasingly social role of software entities push the traditional quest for total global control out of reach. Economic theory of social order offers extensive experience with such conditions, so that it can complement and guide research in computer science. It is shown that a common understanding between economics and computer science's sub-field of distributed artificial intelligence is possible on the level of software-agents. On this basis, four fundamental problems of social order are encircled: first, the requirement to overcome and prevent state of nature situations in the sense of Thomas Hobbes; second, the necessity to accommodate unpredictable individual actors; third, the challenge of exiting the small worlds of traditional software systems; and fourth, the ambition to reach a transaction cost efficient social order. Economics can contribute to an understanding and to possible solutions of these problems by unfolding the idea of liberal order for software-agents. 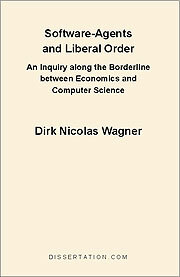 In a systematic analysis that covers the order of rules, the model of the individual actor, and the order of actions, it is shown that the conditions for liberal order can be created, without exception, in agent-environments.